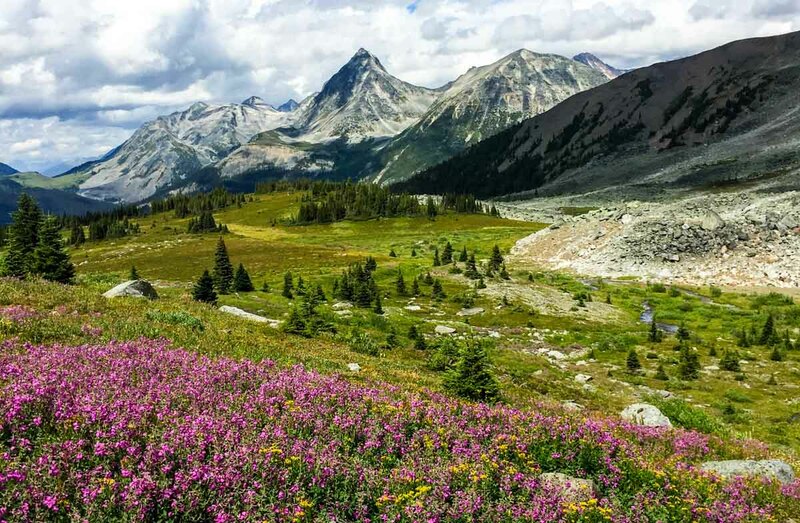 Summer heli-hiking at the Mallard Mountain Lodge is one of the most fun, adventurous, and inspiring holidays in BC. 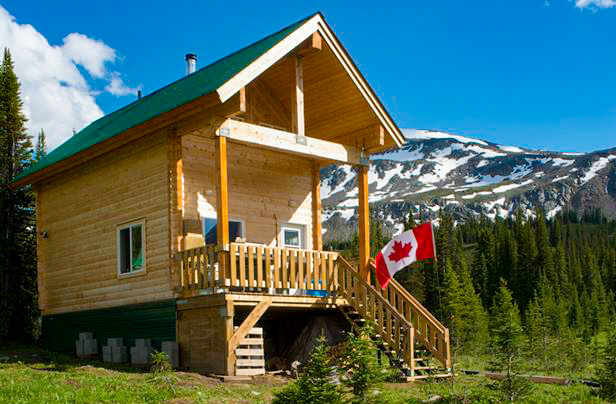 Our lodge is helicopter access only, guaranteeing solitude, serenity, and private access to one of the most spectacular hiking and trekking areas of the BC Canadian Rockies. The hiking here starts at Lodge elevation of 1,900 meters and works up to 2,520 meters and higher. We are in the rugged outdoors but with the optional home comforts of an all-inclusive, catered and guided experience. 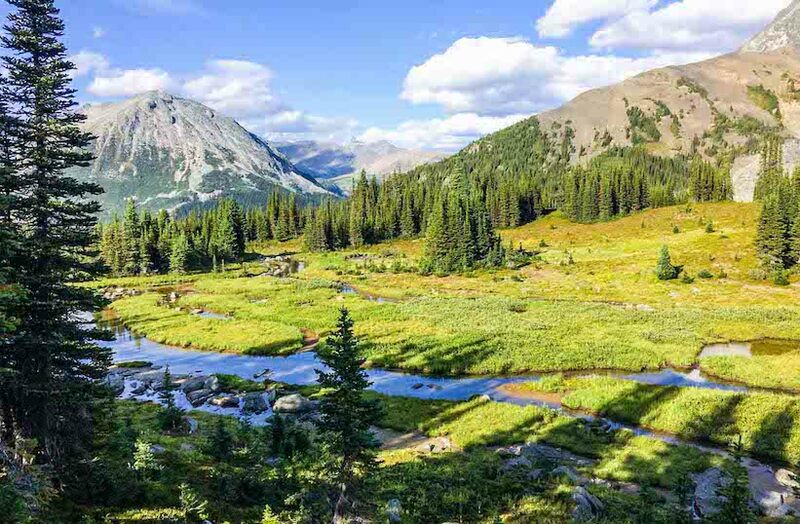 Guests can stay for 3, 4, 7+ nights and we offer daily hiking excursions from the lodge exploring our local lakes, waterfalls, alpine meadows, high alpine trails, high ridges, cols, and glaciers. A sea of wildflowers and intriguing rock formations flow through the 5 valleys and 18,886 acres of our wilderness playground. Groups of 6 to 8 (depending on package) automatically have private use of the lodge and smaller parties can easily reserve the whole lodge for private use. 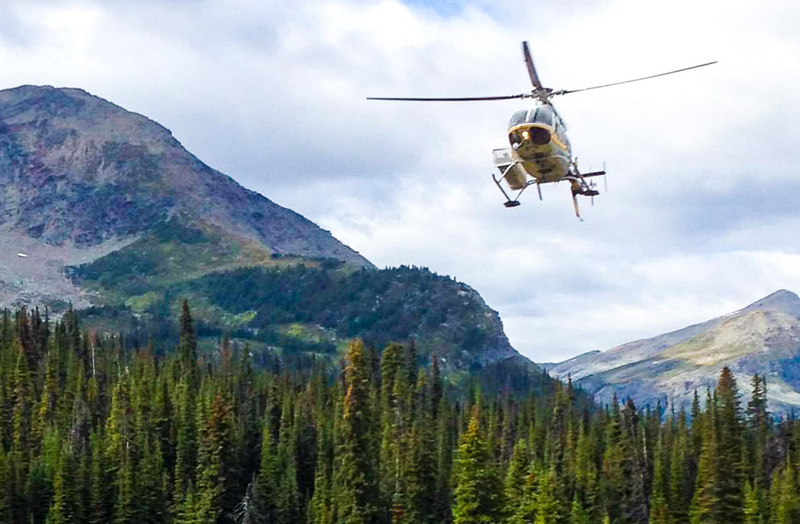 On the first day, our helicopter will drop you off at the lodge which will be your home and your base for exploring the Rocky Mountains during your stay. The lodge’s 1900m, sub-alpine elevation offers a unique opportunity for hikers to get to the goods, fast – the trail begins at your doorstep. 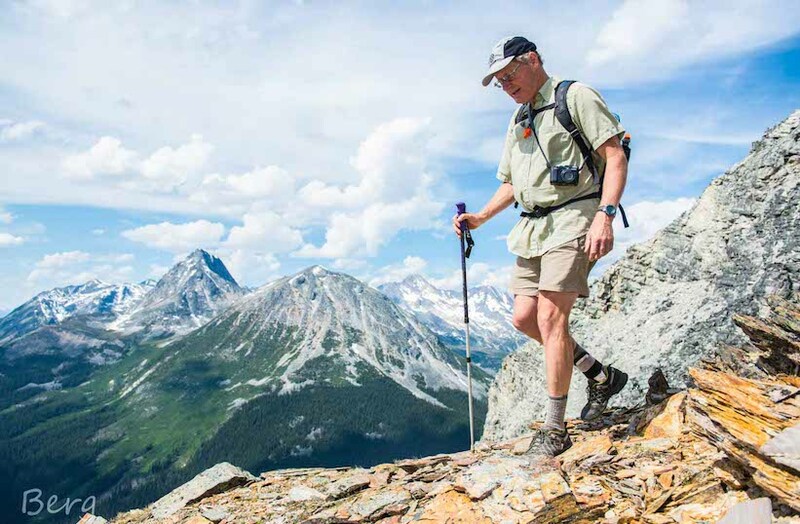 We have a range of intermediate to advance hiking and scrambling routes, making us the perfect wilderness lodge hiking experience for everyone from mixed-ability groups and families to seasoned veterans. How far or how high you go is up to you. Spend all day exploring the peaks and then meander back to the lodge at the end of the day to enjoy good food, wine, and a well-earned rest. In an alpine setting like Mallard Mountain Lodge, weather is variable and can change quickly. Normal summer weather would include temperatures ranging from 0 C to +30 C; winds southerly from mild to strong; cloud cover ranging from blue bird days to full cloud cover; precipitation usually just rain, moderate storms. Exceptional weather could include higher or lower temperatures, northerly winds, stronger storms, and a dusting of snow. ​In general, guests should be intermediate to strong hikers. We are in the rugged outdoors and trails are not groomed. Your hiking equipment and clothing needs to be in good condition and suitable for varied terrain and weather conditions. Groups reserving the entire Lodge capacity may be of any ability level, provided they have discussed this with CAC at the time of reservation. 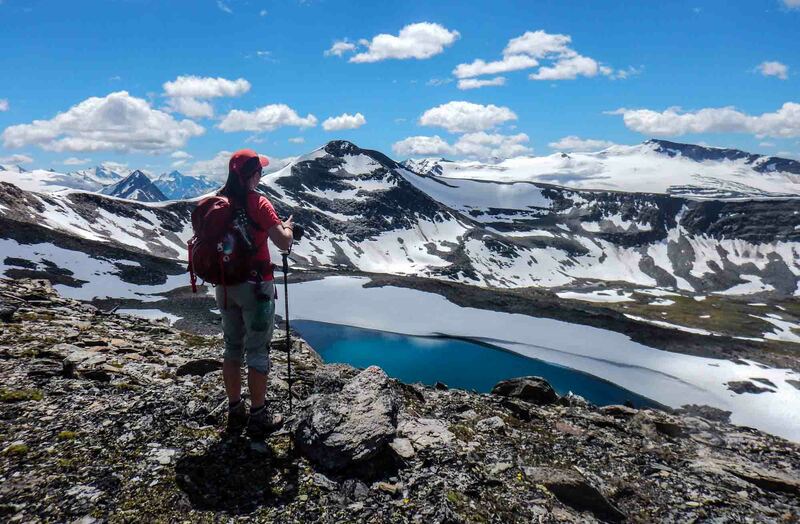 Most hiking is at Lodge elevation of 1,900 meters and higher up to 2,520 meters. View Coordinates & Map. Click the links below for a slideshow selection of misc pictures of guests and terrain. Any booking of 6 to 8 guests (depending on package) automatically qualifies as a private buy-out of the Lodge. Smaller groups can also buy-out the Lodge. See Rates & Dates for Details. Custom packages available – learn more here. Specials for guides bringing their own groups – learn more here. We believe it’s a privilege to take people into the backcountry – and it happens to also be our passion. We’ve got the experience, knowledge & process down so that you can enjoy your vacation. We can’t wait to share our beautiful backyard with you!